If you know South Carolina BBQ, you know the name Dukes. There are a dozen Dukes restaurants in SC at the time of this writing, but while they share similar qualities, they are not all the same. Walk into Dukes of Walterboro and you will not get the exact same menu or experience as you would at the Dukes in Ridgeville. They are not a chain or franchise, per se, but rather a loosely connected assortment of family restaurants. One thing they all have in common is a delicacy unique to South Carolina: hash. This is not to be confused with Brunswick Stew, common in BBQ restaurants in NC and GA.
Hash is a thick stew of sorts whose exact ingredients vary from family to family and restaurant to restaurant, but at its base is a meat product — typically pork, sometimes beef, and often a combination — onions, potatoes, and BBQ sauce, boiled down and sometimes ground into a thick, soupy stew, sometimes lovingly called “liquid sausage,” often served over rice. 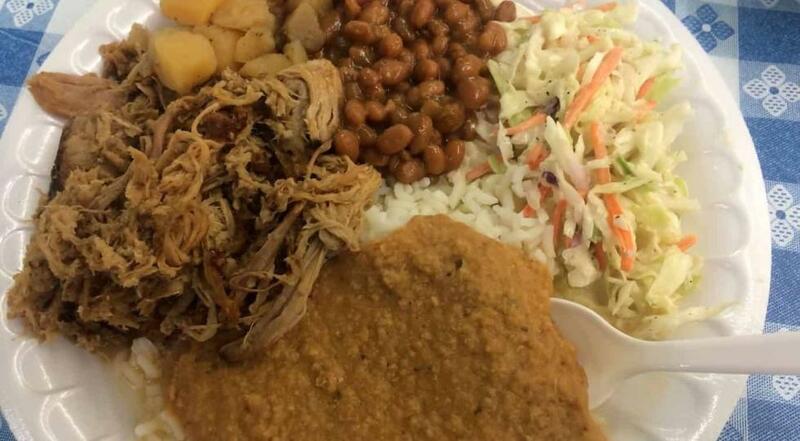 While that may not sound delicious to the uninitiated, most native South Carolinians expect a side of rice and hash when they go out to eat barbecue. Here is a recipe we received from Michael Ott, who originally grew up in Orangeburg County, the heart of Dukes BBQ country. It is not Dukes’s actual recipe. “It’s good, but not a match for Dukes,” he said. Sauté onions with potatoes in a little oil until onions are tender. Stir in black pepper. Pull pork and add to potatoes and onions. Fill with water until covered. Cook until potatoes are done. Blend mixture slightly in a blender and return to pot. Add BBQ sauce, ketchup, hot sauce to taste and vinegar. Simmer until it's the consistency of thick soup. Turn off heat and add butter. Serve over white rice. For a different yet still authentically SC-style hash, substitute half the pork with a beef roast. Then it will have more in common with the hash you find in the Midlands of SC. I just tried this recipe and it is a winner. I am using for a friend’s anniversary party. I wonder if you could tell me how many quarts of hash i would need to feed 100 people. Carolina BBQ sits among the most revered of SCBBQ joints and among those at the top of my bucket list to visit. Texas is not a bad place to be if you had to leave SCBBQ behind….Enjoy! John, sorry for the late response. If I recall correctly, we had about 2 gallon freezer bags leftover after we made this recipe, having eaten some, of course. I would guess 2-3 gallons. Carolina BBQ in New Ellenton, SC has the best hash in this state without a doubt. I’ve eaten hash and rice all over this state and no one does it better than these guys. Make the trip and find out for yourself. Buy some to-go and put it in the freezer. You’ll be glad you did. Thanks for sharing the hash recipe! I’m a S.C. native, but now a 9+ year Texas transplant, and I’ve really missed S.C. hash. The recipe is perfect and we can now have hash again, even in Texas! Love it. Anyone know how much this recipe makes? The best I have had is Dukes in Blackville, SC. Try it. live in Orangeburg, Dukes in Orangeburg does come close. Thanks, Frank! Glad you are able to enjoy a bit of Dukes at home. (Guess I’ll quit complaining about early April highs in the upper 60’s as being too cold.) I have been shocked to find that this recipe page is the single most visited page on our site almost every day since I posted it. We can’t get to South Carolina very often, and we really miss Duke’s in Ridgeland. Having recipes like this BBQ hash lets us bring a the spirit of Dukes here to Fridley, Minnesota. Thanks for posting !! !